If you’re like me then you like to have the latest and greatest in technology, especially if it’s your tool(s) that generates your income. I’ve been waiting for the 2nd gen MacPro to come out (I assumed it was going to be part of the Spring 2015 releases), but that came and passed with no luck – again. Being on a maxed out 2012 15″ MacBook Pro Retina was great for a while. Even the battery still lasts a good 3-4 hours! I however quickly met the limits of the machine with my line of work. I figured If I purchased a new MacBook I’d wait for the new Intel Skylake CPU, but of course Apple nixed it from the 15″ 2015s (13″s got it). So I pulled the trigger on the newest 15″ MacBook Pro Retina (Mid 2015). One of the biggest changes = GPU. Apple went from the typical GeForce (650M) application to the latest AMD Radeon chips (R9 M370X @ 2GB). The GeForce out of the box could support at least 3 monitors using your standard HDMI out and Mini DisplayPort (mDP) to DVI/HDMI/VGA (average cost of these cables range $10-$20). When I swapped the 2012 for the 2015, one monitor sadly stood in the darkness. When I called Apple (whom handled my call actually phenomenally) they had no answers at all.. researching online (e.g. “MBPR 2015 multi monitor”) lead to NO answers (including a revolving reddit post), and I sure as hell didn’t want to use a USB based external display..
Few days later… Radeon chips lack passive display connections (or timers?). Picked up an “active” mDP cable, darkness to life. These GPUs only support two passive connections, the rest NEED to be active cables. The cable I purchased was around $30-40. I was seriously considering modifying drivers to get this to work (I knew the GPU had more than enough power to handle said situation). I also figured out that these GPUs can handle up to 6x (1080p) monitors (via ThunderBolt split). 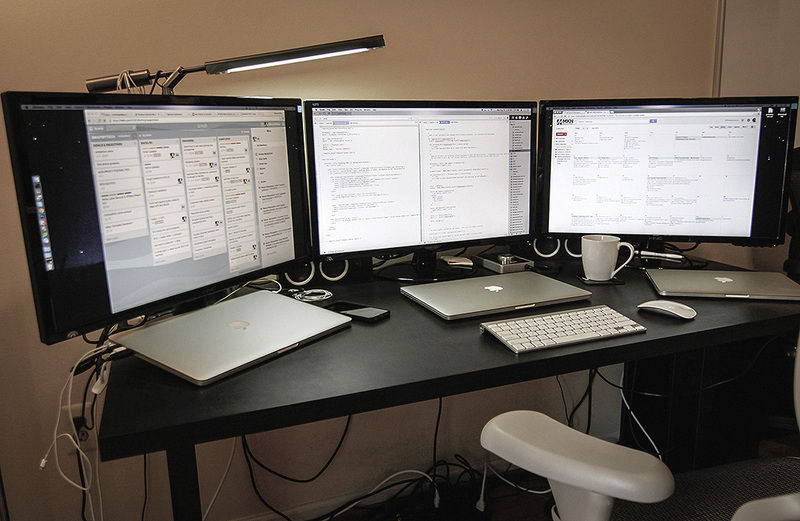 I’ve officially updated my triple monitor setup to three 2k (1440p) monitors. According to the spec sheet the MBPR GPU should only be capable of two 4k monitors at native resolution, hence my move for the 3x 2k monitors. More specifically I ordered the Acer K272HUL monitors (Around $300/ea) which include the DP / HDMI inputs. 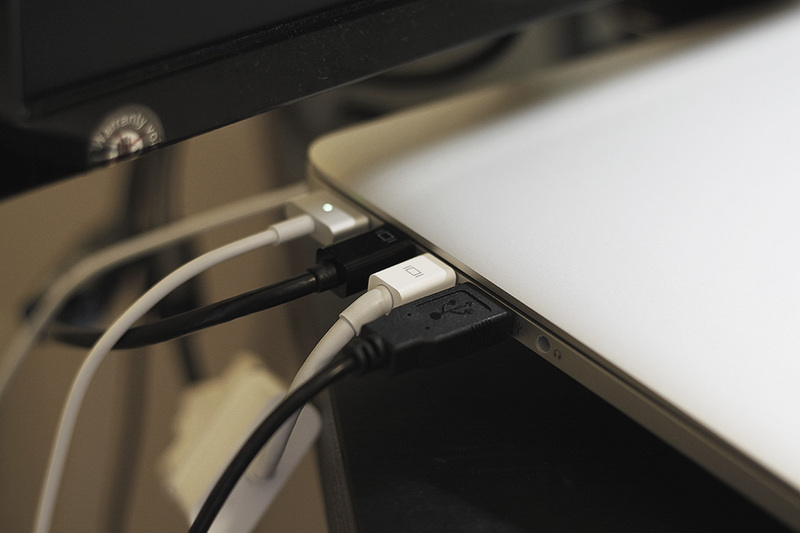 The monitor is capable of daisy chaining (Has a DP in + DP out connectors), however the Mac OS doesn’t recognize it – it may in the future. To get these monitors to work you need to buy 2x regular miniDP to DP connectors and one latest standard HDMI to HDMI cable (to support 2k+). These Acer’s are super crisp and clear; Youtube 4k videos look amazing on here. Do note that your Mac OS may recognize these screens as TVs and require a quick driver update (contact me for more information and I’ll shoot over what you need). Hopefully this article helps those in the situation I was!